It seems the tide of traditional heavy metal has changed and is once again coming in to flood the music world with a form of music that is actually passionate and worth listening to. PEGAZUS are riding the wave high and proud with their classic sound and airtight delivery. Although far from my favorite of the latest wave of heavy metal, this is still a band that had what it takes to turn the clueless wannabe fans who think bands like KORN are real metal on their ear. 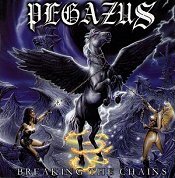 PEGAZUS are not forging ahead in their metallic quest but are reaching to the past when being more extreme, faster and heavier than the next guy took a back seat to actually writing quality songs and playing with dedication and a love of hard rock. Clean vocals and plenty of melody are trademarks of "Breaking The Chain" and anyone who remembers the pure metal underground of the mid and late 80s will immediately relate to this CD. There is even a classic HELLOWEEN cover, gotta love that.